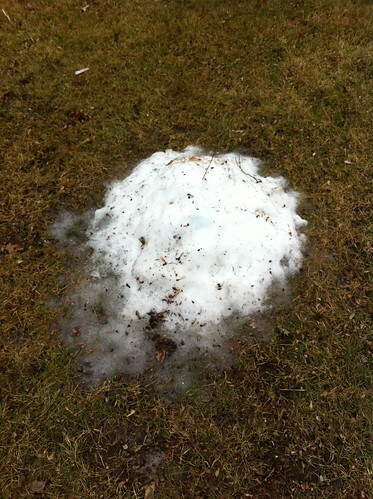 So earlier this week I had a post about the coming thaw and whether or not my 'snow monster would survive. It was a long, drawn out thaw, and there isn't any snow to speak of in town anymore. 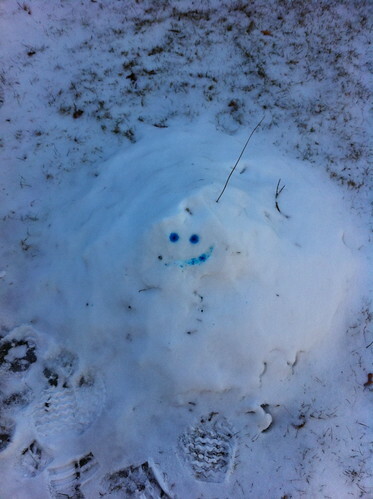 Still, the snow monster was able to pull through and now exists as a sorry pile of icy snow outside my back door. Temperatures are back around freezing, and some snow may occur tomorrow night, so the snow monster will be sticking around for now. The January Thaw is a well-known weather event that occurs during most winters. After weeks or even months of almost entirely below freezing temperatures, the weather warms for a couple of days, usually around this time of year, it often rains, and all of the life in the forest (and the city) that has trouble getting through the winter gets a little breather. The phenomena is strong enough to show up as a blip on average temperature charts in some areas, a slight warming in the coldest part of the year. Last year the most significant January thaw happened at the start of the month. The year before, the thaw came as a howling gusty downpour from the south, temperatures in the 50s, and enough rain to form ice jams. Countless other January thaws are remembered in stories told by the old-timers. Whether you hate them (due to ruined snow or ice jams) or love them (if you hate the cold), these thaws are a part of Vermont's weather and hydrology. This January's thaw, though, is a tricky one to a put a finger on. Why? We've already had several thaws, complete with rain and temperatures reaching above 40. We've also had several respectable if not unusual cold snaps, with temperatures below zero throughout the state. In fact, just two days ago I was up in Hyde Park and the temperature got down to -16. The Lamoille River was steaming as if it was boiling, because the contrast between flowing water and subzero temperatures was so great. Now? It's in the mid 30s, the temperature is still rising, and the radar (and my earlier walk by the river) tells me it will be raining soon. The rain will not be able to soak into the ground (despite the several thaws of this month, the ground is frozen deeply due to lack of snow cover, and will not thaw from this warm spell) and the river will undoubtedly rise. Although 36 hours of temperatures in the mid to upper 30s is not enough to melt all the ice formations around the river, the raising water will be enough to rip much of the ice loose and perhaps create some small ice jams. This storm isn't nearly as strong as the one two years ago, so I doubt any ice jams will be big enough to cause problems. Yesterday I met up with Bridget Butler, Conservation Education Specialist at the ECHO science center in Burlington, Vermont, to discuss Vermont watershed issues. She showed me a very neat exhibit at ECHO called Voices for the Lake, which allows museum visitors (and home Internet visitors) to use technology and art to share stories about Lake Champlain and its associated waterways. I had neat posts lined up about forcing Minecraft to create realistic waterways and volcanos, and about Vermont turning to a sheet of ice. However, I'm not going to post them today because Big Lawn would probably accuse me of copyright infringement and shut down this page. Or, at least, they could, if this SOPA law passes (even if I didn't infringe on copyright. I don't support doing that). 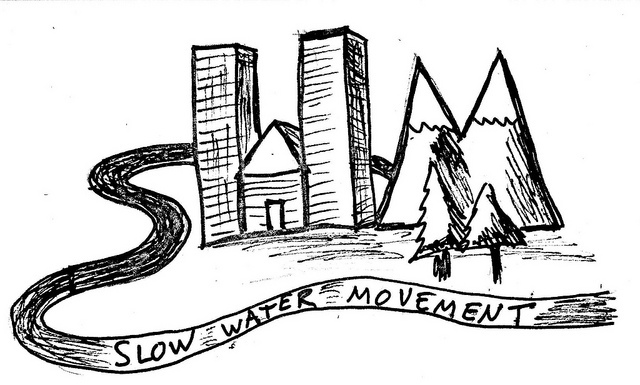 It's a dumb law... almost as stupid as getting rid of stream gages that protect people from flash floods. The US government seems to be on a roll with bipartisan support of dumb laws lately. It's well past time to demand changes. Free speech is one of our fundamental rights, but still one we need to fight for, as those who would censor us try to chip away at them every day. You should go here and sign this petition, or read this. Later this week I'll be back to posting about the river or my new ideas about Minecraft water. This winter has been a mostly mild one for Vermont so far, but over the weekend a blast of frigid air moved into the New England area, spreading low temperatures below zero (F) in nearly all of Vermont, and pushing single digit temperatures as far southwest as Boston. I was in Boston for part of the weekend, and while temperatures weren't quite as cold as in Vermont, they felt in a sense colder. Icy air blasting through skyscrapers and over concrete have a special sort of cold to them, especially considering that this was a 'brown freeze' for Boston (there was no snow). The cold blast came right after a rainstorm, with temperatures dropping from 52F to 6F over two days, causing ice to form in unexpected places. 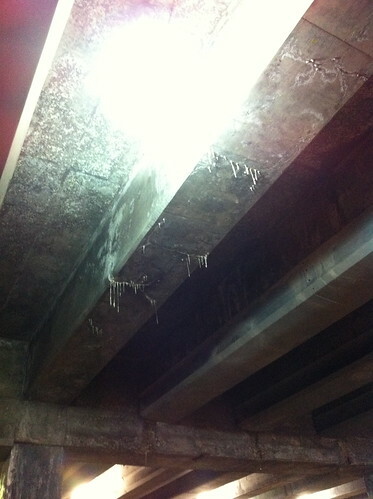 As below-freezing temperatures seeped into the subway stations, residual rainwater found its way through ceiling cracks and created these bizarre, stalactite-like icicles. Over the last two months, most of the United States and southern Canada have been locked into a “snow drought”, but for Vermont, at least, some significant snow may be on the way. Snow has been hard to come by this winter in East Middlebury, and it seems that each time we pick up an inch or two, a thaw or rainstorm comes along and melts it. The seasonably cold temperatures and lack of snow have meant ice, and lots of it, and the icy rivers and streams seem out of place flowing through the snowless forests. 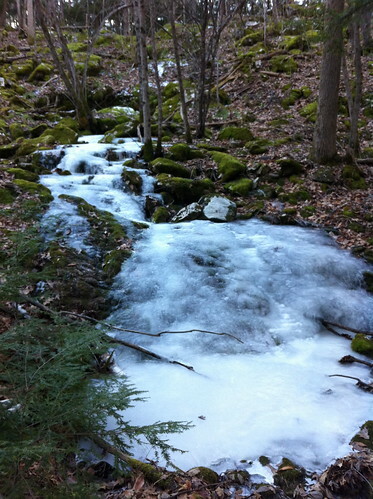 The lack of snow cover has also led to solidly frozen ground, which could translate into a soggy mud season this spring. It's a seasonably cold but snowless morning in Vermont, and the computer models can't decide if the weather this Thursday will feature a warm rain, an ice storm, a blizzard, a mix of all three, or cold and dry conditions. The computer models used to forecast weather are among the most powerful weather tools we have available to us, despite their fickle nature. They aren't the only thing that computer-based technology brings to the weather forecasting table, however. This week I've also been checking out a very different new weather tool, but one which could be the next big thing in weather data collection, or at least a vital aid to National Weather Service offices stricken by ridiculous funding cuts. WeatherSwarm is a beta (still in development) version of what could become a huge distributed system of realtime amateur weather reporters. Think iNaturalist, but for weather. The site includes a map that displays realtime reports of weather phenomena - drawn from Twitter or entered directly into the site. Even more exciting, there is a mobile app in development that will allow weather to be reported directly from the field. It's currently being tested (I'm helping!) but hopefully will be available to the general public soon. Vermont has finally picked up a little bit of snow, but California is not faring as well. After a relatively wet start to fall in at least southern California, conditions have become extremely dry across the entire state. Winter has finally come to Vermont. There isn't a lot of snow in East Middlebury, but temperatures have plunged. Last night it was in the single digits. Plummeting temperatures have frozen many waterways, but fast moving, clean water does not freeze even if cooled below its freezing point. 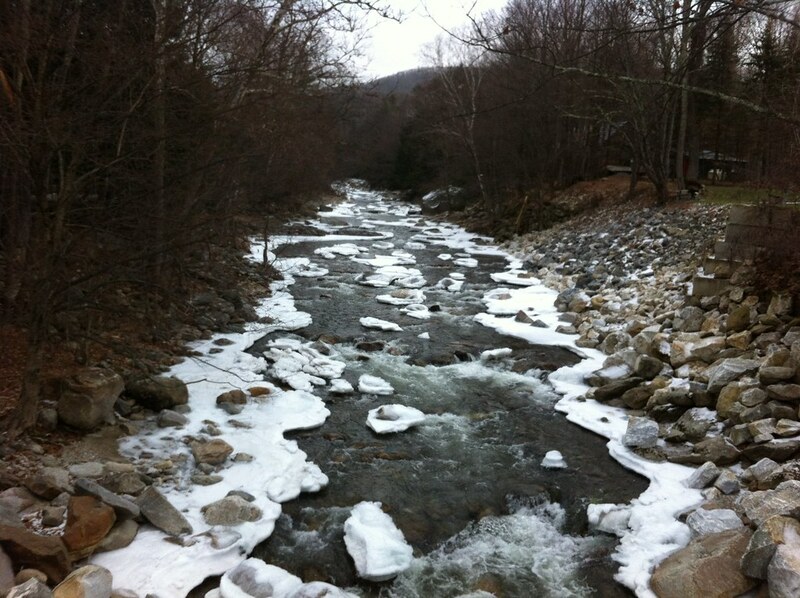 The Middlebury River has been freezing on its edges and in slow spots, but there is still lots of open water in places. 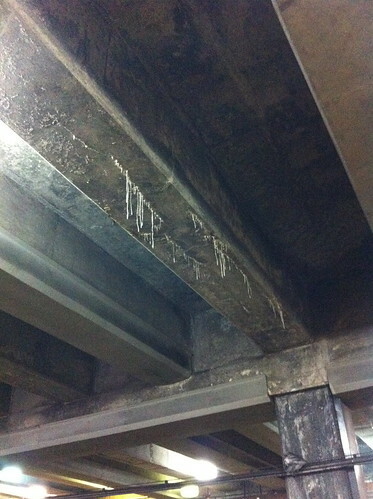 When temperatures are very cold, but water is moving too much to freeze normally, frazil ice formation can occur. Frazil ice is a mass of ice crystals, resembling slush, that often forms in fast-moving water, especially downstream from rapids and waterfalls that splash mist and water into the frigid air where it can freeze. It then falls back into the river and moves along, creating an effect that resembles a watery 'slushie'.